This past week we took to the streets of Hopkinton, Ashland, Natick, Wellesley and Newton for our 22 miler along the Boston Marathon course. We saw some strong runs by our marathoners and half marathoners alike. The excitement that the Boston course brings will hopefully push you through these last few weeks of training and on to some stellar performances. Now its time to let those legs recover a bit. We have a 15 miler on tap for the long runners, and a 7 miler for the half route. I may revamp the route since we ran a similar route just two weeks ago. Give me a few days to figure that out. The important note I want to make right away though is we’ll be running on Saturday this week. Sunday is Easter so we’ll encourage you to spend the morning with your family eating candy. Ok peeps, its finally Springtime. Easter is here. Opening Day is around the corner. And the Boston Marathon is finally in sight. 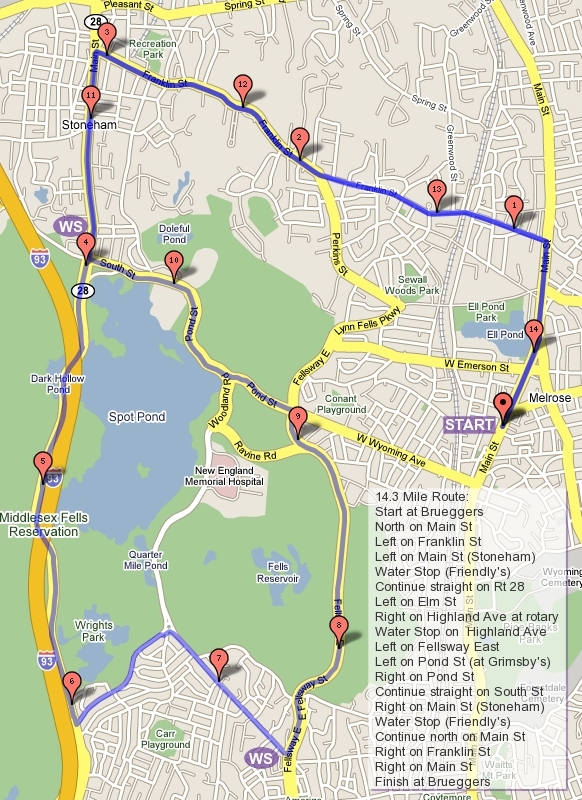 After your 22 miler we’ll be going for a run just short of 15 miles out to Horn Pond in Woburn. Yes, we’re getting you off of Main Street in Melrose!!! The route will start out down Main Street to West Wyoming. A right on West Wyoming will bring you up to Spot Pond. Go right there, past the zoo, past Friendly’s, onto North Border Road. You’ll get to a set of lights where you take a left onto Marble Street. Run over I93 and find the water stop on Eugene Rd on your left. After the water stop, if you’re running long, continue on what is now Forest Street down hill to a set of lights at Washington Street where you take a left. At the next set of lights you take a right onto Cross Street that will bring you over to Woburn. Turn right onto Main Street and cross to the opposite side of the road, you’ll take a left on Lake Ave in short time. Lake Ave will take you down to Horn Pond where you’ll find the next water stop in the parking lot at the pond. After this water stop loop around Horn Pond clockwise. This will take you along a paved route through the woods up to a road on the other end of the pind. Follow that road to the right and up a big hill to Arlington Road. Turn right on Arlington and follow the road along the pond. If the snow has cleared you’ll find markers for the planets spaced out proportional to their actual distance apart. When you get to the end of Arlington, if you need another drink turn left and hit the water stop once more, if you don’t need a drink go left onto Lake Ave and head back the way you came. A right on Main St and a left on Cross St will take you back into Winchester. A left on Washington and a right on Forest will bring you back up to the first water stop at Eugene. After that water stop go back over I93 on to Marble. Marble will bring you back to Main Street in Stoneham. Cross Main St to Summer Street and follow that to Franklin Street. A right on Franklin will bring you past Stoneham High School and into Melrose. Turn right on Perkins and let the hill carry you down to the LynnFells Parkway and turn right like you would on the MRC Winter Route. LynnFells will take you over to Grimsby’s, go left on West Wyoming, left on Main Street, and back to Brueggers. Second to last SLR done! Running the Half Route? You can either come out to Eugene and start there so you get to run someplace new, or run to Water Stop 1 and then follow the end of the route. This will get you about 8 miles. So now that you’ve made it past the Boston Course run, its time to taper, or as we at the SLR call it “Don’t do anything stupid time” We want to keep you healthy for race day, so take these runs at a good training pace, but don’t push past what is comfortable. At this point in time we want your muscles to recover in the next two weeks, maintain your fitness but don’t tax those muscle fibers. Have fun for the next two weeks! Water Stops: I think Jannel, Paul and I have the stops covered. Thanks to others who have volunteered. Jannel and Paul, we’ll meet at Eugene at about 8:15 or so. Thanks again! Also, we’ll have a guest for this week’s run. Welcome Toni Ann, a student from Boston University, who will be doing a video piece on us for her Journalism class project. You’ll see her along the course, at water stops, and at Brueggers covering our little group. She’ll be looking to interview a few runners about running, our program, and your marathoning experiences. Roll Call, Who’s in for the Easter edition of the Sunday Saturday Long Run? Week 12 – The Big Week! We have 42 people in the caravan to Hopkinton, with about 40 seats (possibly more). Two more people will meet us out there. Read over the package. Note we’re leaving at 7AM, be there, be ready, know where you’re going. There are more than enough water stop helpers and drivers so that if you want to run some you can. For most that wanted “a few miles” I put you down for running a half. As far as I know the following will be available all morning to drive Jim, Derek, Lisa, Gillian, Paul, Jackie, Jeanne Murphy, Mike Fitzgerald, Bridget. Ensure one of them or another half runner is available to drive you car the distance you won’t be. Also, just one more roll call (so I know you know the plan). Who’s in?! Week 11 – First Run of Spring!!! Oh sure, its 17 degrees as I write this, and there is more snow in the forecast, but today is the first day of Spring! Our traditional first day of Spring run is supposed to bring us through a few wooded areas. I’ll try to keep to most of them, but there will have to be one detour since once of them is Breakheart. I don’t have the alternate plan worked out yet, but I’ll come up with something so stay tuned. EDIT: Ok, here’s my take on the route. Start out by crossing over and running up East Foster to Melrose Common. Take a right on 6th Street which will become Swains Pond Ave. Follow that through Swains Pond around to Lebanon Street. Turn right on Lebanon and left at the lights on Forest Street. That will take you to the first Water Stops at Citizens Bank in Malden. Leave the parking lot on Winter Street, past the Oak Grove T Stop, and into a 5 way intersection. Go straight across onto Glenwood St. This will wind itself over to the rotary at Highland Ave, where you turn righ onto the Fellsway East. Follow those familiar hills over to Grimsby’s and onto the Lynn Fells Parkway. You’ll find a water stop across from Melrose Middle School. After that stop head down the LynnFells Parkway to Main Street in Saugus. Here is where we differ from the prescribed route. Turn left on Main Street and follow it to Farm Street. There will be a water stop around Wakefield High School. Continue on Farm Street and turn left on Water Street. This will bring you to Wakefield Center where you turn left on Main. Follow Main back to Melrose. Turn right on LynnFells Parkway back to the stop by Melrose Middle School. From there head out along theLynnFells Parkway, left at Grimsby’s, left on Main, back to Brueggers. The half route will stay as originally planned. Run with the long route runners through water stop 2 and up to Main Street in Saugus. Turn back along Howard Street to Main and back to Brueggers. As for the logistics of this run, I won’t be there this week. Our regular volunteers: Jannel, Jackie and Christopher, and Paul will be there. Nancy, Ashley, Thuy, and Lisa have also offered. I’m going to stick to the regulars and maybe Thuy this week. Nancy, can you be a backup for any of these people if they can’t make it? I think that should do it. The rest of you are off the hook for this week… but I’m going to need you for next week… the Big Week! Paul, can I put you in charge of making the route announcement (including a gentle reminder that next week is the 22 mile run and if you plan on heading to Hopkinton with us you have to post on the blog to go otherwise you won’t have a spot in a car) and distributing supplies? I’ll buy them all and drop them off on Saturday. You can just hit the water stops and pass them out. Jannel and Jackie, meet at the first stop, Paul will drop off supplies. After the runners show up Jackie can leave the first stop and head to the second stop. Paul can collect supplies from Jannel after the runners go through and take them to water stop 3 (wherever that ends up). If I need a water stop 4, Thuy can meet Paul there, get supplies and head out to water stop 4. That’s it for this week. This is the official ROLL CALL for this week… Who’s in? As for next week. We’ll be heading out to Hopkinton at 7AM from Brueggers to run 22 miles on the Boston course. This is the official call out for volunteers to drive and water stop along the way. If you can volunteer post here with how many people including yourself can fit in your car. Also if you want to run a portion of the route and help with water stops for a portion of the route, let me know that too. I’ll pair you up with someone else so they can drive while you run and vice versa. Runners, when you post for the roll call this week please let me know if you plan on running next week. I need a solid count of runners so I can ensure we have seats in the carpool for them. There will be more on that later. Thanks. Ok, that’s it for now. Look for the route tomorrow, have a great run Sunday, and keep your eyes open for logistics for next week here. The route is simple: Head up Main Street into Wakefield, hitting Water Stop 1 at Nicks). Head up to Lake Q along Main Street and through the Converse Parking Lot over to North Ave. Follow North Ave back to the Water Stop 2, still at Nicks. From there run Nahant Street over to Wakefield High School into Breakheart. We’ll won’t do a full circle of Breakheart, but I think we can do the flat side out to the Saugus side and back (unless someone reports to me that its too icy, this week did a lot to clear snow, but I’m not sure the sunshine and warmth got into Breakheart). Come back past Wakefield High School, down Nahant, and back to Water Stop 3, still at Nicks. After that Water Stop, head back Main Street to Brueggers and you’re done. Running the Half Route? You come out to Nicks Water Stop 1. After Nicks Run up to the lake but take a left on Church Street. Take that over to North Ave and take a left to bring you back to the Water Stop, at Nicks. After that run back down Main Street to Brueggers and you’re done. Water Stops… there’s only one. Volunteers take the week off, I’ve got it! Speaking of water stops, Jannel, our wonderful water stop 1 helper was feeling sick last week. I hope you’re feeling much better, let me know how things are going. That’s all I’ve got. Who’s in? Roll Call!!! Last week we improvised a new route and got 18 miles under our belts. This week we notch it up again and go for 20. We’ll keep to the prescribed route this time and hope for the best. Most of the roads are major roads and wide enough to accommodate our single file line of runners. This week is a big test for your goal race. I’m sure we’re not expecting it to be in the 30s on your race day, and hopefully we still don’t have giant snowbanks about, but other than that you should try to make Saturday and Sunday just like race day. Saturday you should test out your prerace meals, maybe some Chicken Carsonara tonight, and some scrambled eggs and peanut butter in the morning… those were my prerace meals. I’d tell you to get the same time of sleep you would on race day, but two things will make that not happen: 1) we move our clocks ahead Saturday night so you lose an hour of sleep, 2) you’re not as nervous as race day so you’ll only lose that one hour of sleep instead of the multiple hours. Try to wear your race day shoes tomorrow, and if you think you’ve been wearing your race day shoes all along take a look at the soles and realize they might not make it to race day. If you like this pair start a new pair of shoes for your shorter runs over the next 5 weeks. If you don’t like this pair start breaking in your race day shoes now. Race day socks matter, Sunday will be a good day to see if they tend to cause blisters when the miles go over 20. Speaking of blisters, a tip from my foot doctor years ago: blisters are caused by wetness on your feet, try putting antiperspirant on your feet to keep the sweat from getting the skin moist. It worked for me. The run starts our like last week, head south on Main Street and turn right on West Wyoming. Go past Brueggers and up Pond Street to Spot Pond. Turn right at the pond this time, heading past the Stone Zoo, past Friendly’s, past the onramp to I93 to a set of lights where you turn left on Marble Street. On Marble watch for the water stop, it would normally be over I93 on Eugene but due to snow banks we’ll probably be on the right on the corner of Hill Street where we have a little more room. From the water stop both Full and Half runners continue on Marble, over I93 and straight onto Forest Street in Winchester. A downhill will take you a left on Highland Ave. Up a hill, past the Winchester Hospital, stay on Highland all the way to the end, unless you’re running the half route. Half route turn right on Eaton Street, there’s a park on the corner that makes this street look different, although now it’ll look like a block of snow like everything else. The rest of your route is a right on Washington Street at the bottom of Eaton. Follow Washington to Forest Street, an intersection with a set of lights and a Gingerbread Construction Company. The right will bring you up Forest back to the first water stop. After you stop there again head back the way you came. Turn right on Park Street, past Friendly’s and the Zoo to the right on Pond. Pass Grimsby’s and follow West Wyoming to Main Street. A right on Main will get you back to Brueggers with your first 10 mile run of the season done! Full route runners, you’re still on Highland Ave. Keep going until you get to the water stop at the end of Highland. After that stop you’ll go right on Main Street, Rte38, into Medford. Cross the road when you see a cemetery on the other side. At the corner of the cemetery you’ll take a right on Playstead Rd. This will take you to High St, Rt 60, by a commuter rail station. If you need to use a restroom the Dunkin Donuts on High Street has always been very friendly. A right on High Street will run you towards Arlington. There is a fork along the way, you want to make sure you stay left on High Street. You’ll come to a bridge, don’t go over it, turn right on Mystic Valley Parkway. Follow this past the Mystic Lakes to the end, where you turn right on Bacon Street. Take your next left onto the Mystic Valley Parkway again. Along the Mystic Valley Parkway you’ll find another water stop near Winchester Center. After that stop you’re halfway there! Keep going on the Mystic Valley Parkway and take a left on Washington, I believe the second set of lights after the water stop. Stay slight right through a 5-way intersection to stay on Washington Street . You’ll go by a church if you’re going the right way… a church that has a nice bathroom in the side entrance on the far side of the church if you need one. Washington will take you to the Gingerbread Construction Company intersection with Forest Street, turn right there and head up the hills to the next water stop (same as the first). After that water stop go right at the lights on Park Street and continue running to Friendly’s (another bathroom stop if you need it). You’ll go right at Friendly’s and run the back side of Spot Pond, turning left on Elm Street up to the rotary at Highland Ave in Medford. Go right on Highland and you’ll find the last water stop of the run. After that stop go all the way down Highland to the rotary at the Fellsway East. Turn left on the Fellsway East and through the hills to Grimsby’s. Assuming you don’t want to run an extra mile at that point, turn right on West Wyoming to Main Street. The left on Main will bring you up Main Street to Brueggers and a 20 miler to your name! Water Stops: I think I have Jannel, Jackie, and Paul helping again this week. If that’s true that’s awesome! If its not, I need volunteers! The first water stop will see action for a long time this week since its also the fourth water stop. The second water stop will move to the fifth water stop when they’re done, so that one isn’t quick either. The third water stop is only the third, at mile 10.something. So if you’re in for water stop duty, you’re in for a full morning, let me know if that’ll be a problem. Any helpers interested? That’s it for this week’s pre-cap. Who’s in for the first of the really long ones? Roll Call!